The Best Western Plus Hotel Sydney Opera is situated in the heart of Paris, within walking distance from popular attractions including the splendid Opera Garnier, the Tuileries Gardens, the Louvre and many more. The lively area around the hotel is ideal for shopping, with Paris' major department stores nearby, and offers abundant dining options. The hotel features 36 rooms in a Napoleon III style building with modern finishes. Well-appointed rooms feature charming decor and surround you with the comforts of home. 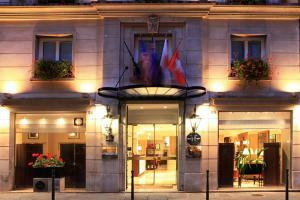 This hotel is 10 miles from Orly Airport and 14 miles from Charles de Gaulle Airport.